Personal laws are considered "personal" because they deal with the domain of family - marriage, divorce, maintenance, adoption and inheritance. The debate around having a Uniform Civil Code (UCC) for all religious communities goes as far back as 1947, and had polarised the Constituent Assembly then as well. It was decided then that they were to be included under the Directive Principles of State Policy instead, which are not enforceable by themselves but are meant to serve as guidelines. But the Hindu personal laws, which were far more regressive and discriminatory towards women than the Muslim or Christian laws, were reformed and codified in the 1950s. A series of legislations known as the Hindu Code Bills were passed, thanks to then law minister Dr BR Ambedkar and then Prime Minister Jawaharlal Nehru, even amidst stiff opposition from Hindu leaders. Meanwhile, Muslim personal laws have been left untouched. But Muslim women have been asking for reformation of the Muslim personal laws for a few years now. 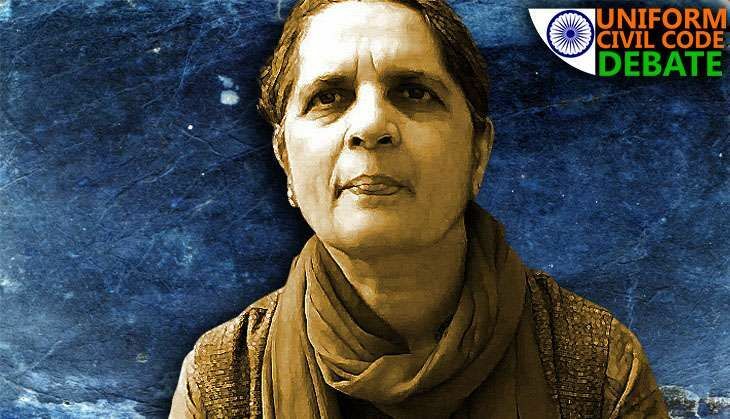 The issue first made headlines in 1985, when Shah Bano, a woman in her 60s who was divorced by her husband, filed a lawsuit in the Supreme Court seeking maintenance. She won the case and was awarded the right to alimony. But the Congress government, facing pressure from Muslim orthodox leaders, passed the regressive Muslim Women (Protection of Rights on Divorce) Act, 1986, which then reversed the Supreme Court judgment. However, ever since Muslim women's groups have continued their battle. The current debate whipped up around the UCC by the ruling BJP government seems to have roused mass sentiments. The mobilisation in part is because of the questionnaire on UCC circulated among the public by the Law Commission of India. In fact, the UCC has been a fixture on the BJP's election manifesto ever since 1998, with the sole exception of 1999 when there was no manifesto but rather a 'National Agenda for Governance' put forth by the NDA. The UCC takes its place of pride, as one of the BJP's three core issues, alongside the construction of a Ram Temple in Ayodhya (on the same site where the Babri Masjid was demolished in 1992) and the scrapping of Article 370, which confers special constitutional status to Jammu & Kashmir. It is clear that personal laws of all religious communities are discriminatory towards women. So do you think, in principle, having a Uniform Civil Code (UCC) is a good idea? Mary John (MJ): See, there is no 'in principle'. We are living in a situation of extreme marginalisation of Muslims. The last two years in the country have been especially bad for them, but the community has been facing different kinds of marginalisation for decades now. There is no level playing field here. Hindu majoritarianism has become our ethos. Under such unequal conditions, there is no 'in principle'. There is a politics to the UCC. The current government has clearly turned the UCC into a political battleground against the minorities. They are trying to use it as a stick to beat the Muslims with. Considering the nature of the ruling party that has not exactly cared for the interests of Muslims in the past, it is hard to believe that they suddenly have the interests of Muslims, and Muslim women, on their agenda. What we need are other, multiple strategies to tackle the various forms of discrimination against women in different religious communities. We need changes within the framework of the personal laws. But, the UCC has been on the BJP's agenda and election manifesto for a long time now. It is not about gender justice, it is about control. The government is masking its intentions with the language of gender justice. Earlier, the party did not even use the term 'gender justice'. They simply said that we need uniformity. Why is the BJP so bent on bringing about uniformity? What will that uniformity look like? Uniformity is not a virtue in itself, just as multiplicity and diversity are not vices in themselves. You can have bad uniform laws and you can have multiple ways of doing things well. We can have good Muslim laws, good Christian laws, good secular laws. Uniformity makes it easier to govern, to control the population, that's all. Under the prevailing climate, the UCC is not at all the way forward. Prof Mary John: Under the prevailing climate, the UCC is not at all the way forward. Muslim women in the recent past have themselves come forward asking for practices like the 'triple talaq' and polygamy to be banned. MJ: Yes, Muslim women and Muslim feminist groups have been fighting against these and other discriminatory practices, BUT they have never asked for a Uniform Civil Code. They only want changes in their personal laws in order to bring in gender justice. They demand that the Muslim laws be reformed and codified. They want their rights to be secured within the framework of Islam, not a UCC. Recently, Shayara Bano came forward challenging the triple talaq in the Supreme Court and others have joined her. Many organisations have backed her as well. The Bharatiya Muslim Mahila Andolan (BMMA) has been fighting for banning practices like triple talaq and polygamy for a few years now. In fact, the BMMA had even come up with a model draft of Nikah Nama, a set of norms governing marriage among Muslims, which seeks to empower Muslim women. These demands were largely ignored by the Muslim clergy as well as the governments. But no Muslim woman - for whose interest the government claims to be pushing the UCC - has ever brought up the need for the UCC. Then why should they have to go through the route of the UCC to get justice? Reforming a personal law and imposing a UCC are two entirely different things, which are being conflated for political motives. Muslim groups like the All India Muslim Personal Law Board (AIMPLB) have vehemently opposed the UCC and said they would boycott the questionnaire circulated by the Law Commission of India. They have been criticised for their refusal to engage. MJ: Of course. The government has opened up a trap for Muslim leaders by suddenly whipping up the UCC debate in this manner at this point in time. And most Muslim leaders have obviously jumped into the trap because they have perceived this as an attack on them, their community, and their authority. As I said, the battle is not about gender justice, it is about control. It is about a hegemonic Hindu Right-wingers wanting to control the laws of a minority group, and about the Muslim leaders not wanting to lose the control they exercise. Look at Pakistan. They have done a much better job of reforming Muslim personal laws, whereas we have not even created a conducive environment for Muslims to discuss reformation. They don't feel secure enough. Women are the ground upon which this battle is being fought out. Muslim women, who had been asking for something else, are getting frustrated as their concerns are being used in this other issue. So far, women and feminist groups from the Muslim community were having discussions, going back and forth on what could be the best way to go about securing gender justice within Islam. And if we are really worried about gender justice for Muslim women, why just restrict it to family laws? We must take into account several other social and economic factors that have pushed Muslim women to the margins. We should look at questions like how many Muslim women from poor families are able to find decent work? What is their political representation? What and how much space do they occupy in public life? Then we'd be at a better place from where to hold discussions from. What do you think of the contents of the questionnaire on the UCC circulated by the Law Commission of India? MJ: The questionnaire claims to "begin a healthy conversation about the viability of a uniform civil code", but it is a highly loaded questionnaire. It is not genuinely interested in issues of the UCC or gender justice. Just look at the questions that are being asked, and the way they are being asked. Somewhere down the line there is one question about Hindus and one about Christians, but the target seems to be the Muslim laws and practices. Muslim personal law has its own progressive aspects. After all, Islam conceived marriages as contracts and had the provision of divorce built into it from day one, unlike Hindu and Christian laws that treated marriage as a sacrament and left no room for divorce. Before the amendments, Hindu law granted absolutely no legal status to the wife. Moreover, Muslim personal law treats family members as individuals, whereas in the Hindu family law there is no concept of the individual. There are many other examples like this. One of the things we should consider is whether we should not come up with our own questions. We should think of what would be a better set of questions to put forward to the public, if we really want gender justice. And yes, we do want gender justice, but the UCC is not the way to get it. The UCC is not the answer to Muslim women's marginalisation. One of the most cited points in support of the UCC is that Article 44 of the Constitution that says, "the State shall endeavour to secure for the citizens a uniform civil code throughout the territory of India". What do you have to say about that? MJ: Please look at the long list of things included in the Directive Principles of State Policy, you'll be shocked. They even talk of a living wage for all people, but the situation in the country is such that we do not even have minimum wage. Article 44 says the state shall "endeavour". Even at the time of Independence, the UCC was a very fraught issue and divided the Constituent Assembly. Because of the Partition, the mood in the country was terrible. It was not the right time to adopt a UCC. The Hindu law reforms in the 1950s also faced huge opposition. Ambedkar had come up with an excellent proposal, but the Hindu Code Bills that were passed were a mangled version of the original draft. The Constitution is full of contradictions. It allows personal laws to be there, it also enshrines gender equality as a fundamental right, it says all religions are to be protected, and then there is Article 44. Maybe in some other time or world, our country would be ready to adopt a UCC, but it currently is not.